MY GAME DESIGNS are now in ‘PEG’S PLACE’ in My own Shop Space. Just one product so far. Watch for more games coming soon! Learn the basics of Astrology using my colorful Astrology Card Game, a new concept just created! This is a fun way to play familiar card games while you automatically get familiar with Astrology. Enclosed with each deck are suggested ways to play the first two of many possible games: Zodiac Rummy and Zodiac Solitaire. Full rules for Astro Rummy – Great for 3 or 4 people. Deal out 7 cards to each player. Turn the remainder face down and turn up one card to start the discard pile. Each player in turn draws a card. When a card is drawn, there must be a discard. You may have the option of picking up the top card from the discard pile or even picking up the entire discard pack instead of drawing a card… But you must have two cards of that zodiac set in hand. In addition, if you take the entire discard pack, because you now have more possibility of winning, YOU ARE REQUIRED TO LAY DOWN 3 SETS RATHER THAN 2 SETS LIKE THE OTHER PLAYERS! Then discard 1 card as usual. When play ends, whoever wins gets 25 points. If a card set of 4 has been already laid down by any player, it doesn’t count against them. When there is a winner, any cards remaining in the other players’ hands count 5 points for the winner. Zodiac Solitaire is played like regular Solitaire except there are 12 instead of 13 cards and no suits. Great for playing and learning when you are alone! Lay out 7 rows of cards across, turning up the first card and turning down the other 6 cards. Deal across the row again, turning up the second card and turning down the other 5 cards. Again, turning up the 3rd card and turning down the other 4 cards, and so on until you have turned up the 7th card. From the cards showing on the table, fill the rows down in order of the signs from Pisces to Aries just like Kings down to Aces. The 12th sign Pisces acts like a King and when there is an empty spot, it fills that spot. With the remainder of the deck, by threes turn over cards and see if they can be used anywhere. Aries acts like an Ace and when you have gone as far as possible, you can turn over the cards by ones to see if any can fit in. Begin laying off the Aries (Aces) up top followed by Taurus (like 2’s) and then Gemini (like 3’s) and so on, until you complete the 4 sets up top. You will win most of the time with these cards and you will learn the order of the signs forward and backward each time you play. Please use the Informational card included in your deck to learn the order of the signs to play Zodiac Solitaire. Zodiac Element Game – Deal 7 cards to 3 or 4 players. Collect 2 sets of 4 cards containing an Element such as Air, Fire, Earth or Water to win this game. No discard is needed to go out. Air signs include Gemini, Libra and Aquarius. Fire signs include Aries, Leo and Sagittarius. Earth signs include Taurus, Virgo and Capricorn. Water signs include Cancer, Scorpio and Pisces. Note: There is a card showing these Elements included in each card deck. Zodiac Birth Sign Game – Before play begins declare your Sun Sign. If a second player has the same birth sign, he or she must choose the sign of a family member instead and declare it. Deal out 7 cards to 3 or 4 players. Collect one set of 4 cards from your birth sign and one set of any other sign in order to win the hand. Winner gets 25 points and play ends. No discard is needed to go out. Zodiac Human Symbol Game – There are just 4 zodiac symbols depicting humans. They are the Gemini Twins, the Virgo Virgin, the Sagittarius Archer and the Aquarius Water Bearer. Note that Aquarius is not a water sign despite being shown pouring water. This sign is part of the Air group of Elements and has been known to be pouring out ideas. The other 8 symbols are animals or objects. Deal out 7 cards to 3 or 4 people. Only 1 set of a sign with people is needed to go out and win and when this happens, the game ends immediately and winner gets 25 points. Note: To vary this game, you could collect one of each of the human zodiac signs rather than 4 of the same sign. Zodiac Numbers Game – Great for kids! Deal 7 cards to 3 or 4 players. Collect any 4 consecutive numbers of the zodiac number cards only. Collect just one set of four to win, picking up a card and discarding a card. Zodiac Fishing Game – similar to the Go Fish Game – another great game that kids and also adults can enjoy with these cards. WHEN YOU ASK OTHER PLAYERS FOR A PARTICULAR SIGN, THEY MUST HAND OVER ALL THAT THEY HAVE OF THAT SIGN. The winner is the first one to collect 2 zodiac sets and win 25 points. Rob The Deck – Deal 8 cards to each player. Lay out 6 cards right side up on the table to work from. 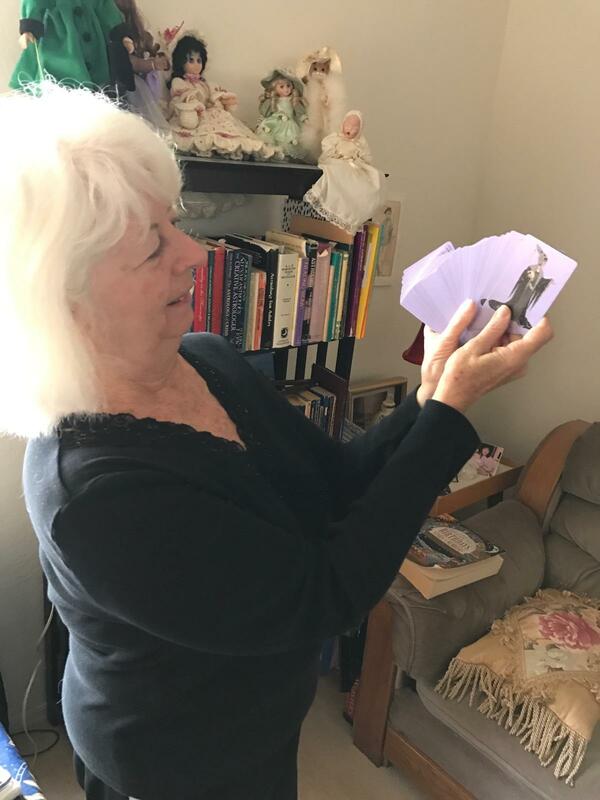 If you hold a card in the same zodiac sign as one on the table, pick that card up and along with the card in your hand, begin to accumulate your pile, facing up. Keep going until you have no match. If you can’t play, lay a card down in the center from your hand. Each player builds their pile. If any player has a card in the same zodiac sign as the top card in your pile, they get to rob the deck and move your pile to theirs and the same for you. Deal out 8 more cards when the hands are all gone and continue playing. When there are no more cards to deal the largest pile wins! Zodiac Flash Cards – Cover parts of the card and guess to see how much you have learned. Watch for more games you can play in my next post. Card decks are now available for $20. (plus $2.85 shipping to the U.S.A.) or come visit me in the Phoenix area and pick up your deck! Shipping cost to other countries to be determined. Email your shipping address privately to me: astrologerpeg@cox.net Payable through Pay Pal at paypal.me/pegyost or by Money Order. Email me for my address. Coming soon: A card game with more advanced levels of Astrology so you can continue learning while having fun!